Is Spyware and/or Adware messing up your internet connection after you have uninstalled it? Has your internet connection slowed down and you just do not know why? Have you used an Internet Optimizer that just did not optimize your internet, instead it made it slower? If you answered yes to any of the questions above, then XP TCP/IP Repair may help fix your internet connection and possibly even protect your privacy. 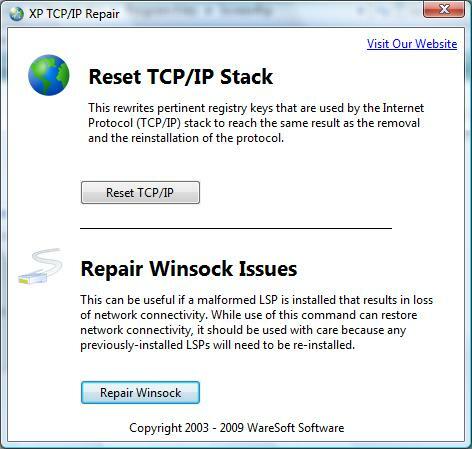 XP TCP/IP Repair is a Graphical User Interface (GUI) for commands in Windows XP?? that repair your TCP/IP registry settings and your Winsock LSP's. Qweas is providing links to XP TCP/IP Repair 2.1 as a courtesy, and makes no representations regarding XP TCP/IP Repair or any other applications or any information related thereto. Any questions, complaints or claims regarding this application XP TCP/IP Repair 2.1 must be directed to the appropriate software vendor. You may click the publisher link of XP TCP/IP Repair on the top of this page to get more details about the vendor.